Is your table Easter ready? Whether you round the family around the breakfast table, host a casual lunch during an Easter Egg Hunt or sit down for a formal dinner, your table needs to be Easter ready, and we’re here to help! What better way to kick off breakfast or brunch with a table of Hot Cross Buns – since they’re seasonal, they’re only available until April 4 this year. Choose from Traditional Fruit, Chocolate Chip, Cranberry Orange, or the new Apple Cinnamon Hot Cross Bun. While Easter isn’t always about chocolate, it’s a hefty part (at least in my household). For that reason it’s best to fill up on a satisfying meal before digging into that baskets of goodies. If you’re making up a batch of sandwiches, try using a baguette like in this Chicken & Spinach Baguette Recipe. By slicing the baguette lengthwise, you can fill it with your favourite selection of meats, cheeses or veggies, and make one long sandwich to cut and share. Our Pane Di Casa Baguettes will make a super-sized sandwich at 60cm long! It’s time for the main event! If you’re not up for a turkey or ham dinner, try Crumbed Lamb Cutlets with Tomato Relish for a special treat. We’ve used Continental Rolls in this recipe to make bread crumbs, but this is a great opportunity to use loaf ends as well. Although not everyone serves turkey at Easter, we’d be remiss not to serve up a stuffing recipe. We’re a fan of our Herb & Garlic Pane di Casa Stuffing recipe which uses a loaf packed with herbs for extra seasoning. It’s also a denser loaf which helps to absorb the flavours. If you haven’t been snacking on Hot Cross Buns since breakfast, now’s your excuse to sneak a couple in. 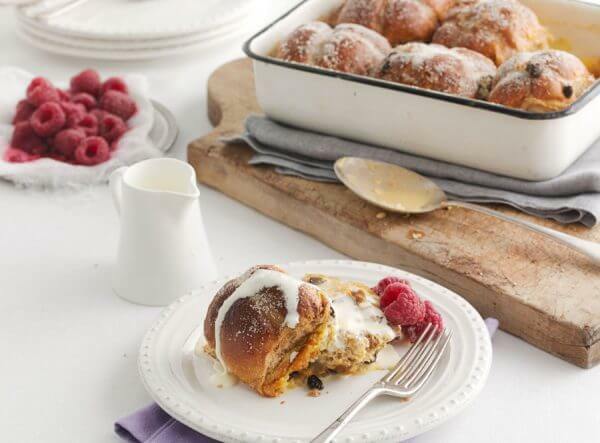 For a delicious and beautiful dessert, this Hot Cross Bun Bread & Butter Pudding Recipe is a treat that’s sure to impress on your dessert table. Looking for more ideas? Check out our blog post for additional serving suggestions with Hot Cross Buns.